Discussion in 'Civ5 - Custom maps' started by PDMX, Jul 6, 2013. Thank you for all those thousands who downloaded and played the map. Version 10 of the map pack is now released! The map is based upon the Fall of Rome Scenario, but it has been greatly extended to fit complete Europe, the Sahara and Western Asia including India. There are several different shapes and pieces of the map, which can be played alone, because it was not possible to add everything even on the largest map size. I have also carefully drawn all rivers so it should be pretty realistic. The map has also been adjusted with more luxuries and strategic resources. The locations of the resources are roughly placed in their natural and climatic appropriate locations. There will be up to 22 Civs available depending on map size. There are also some smaller adjusted regional maps for certain parts of Europe. All recent maps, will always be attached to the first post. Please make sure you open it via the mod menu and load the scenario, if you want to use the preset city states and resources. The Huns -> I decided it would be better to pick Russia instead, because this is a more common civilization. Austria -> It was mainly dropped because of the lack of space in that area, but also due to its ability. Venice -> There are not enough city states around that area, Venice would also hinder Rome to start a major expansion. The Netherlands, Denmark, England, The Celts, Sweden -> The map has been cutted in favor of an East South expansion, I wanted players to be able to circumnavigate Arabia and conquer Asia like Alexander the Great. If you miss any of these Civs, please scroll down and choose the complete Europe map. Bosporus is now a land bridge, but Konstantinopel can be used as a passage, this improves Byzantines performance a lot. Suez Canal is not possible, because the canal was build in 1869, not in ancient times. Morocco now starts on the coast. Attached is the map file. Please make sure you open it via the mod menu and load the scenario, if you want to use the preset cities and resources. The normal World Editor without modding it, only allows to add 22 Civs to the map, so I had to delete some old Civilizations. I hope, that I have deleted the least interesting/most annoying ones. 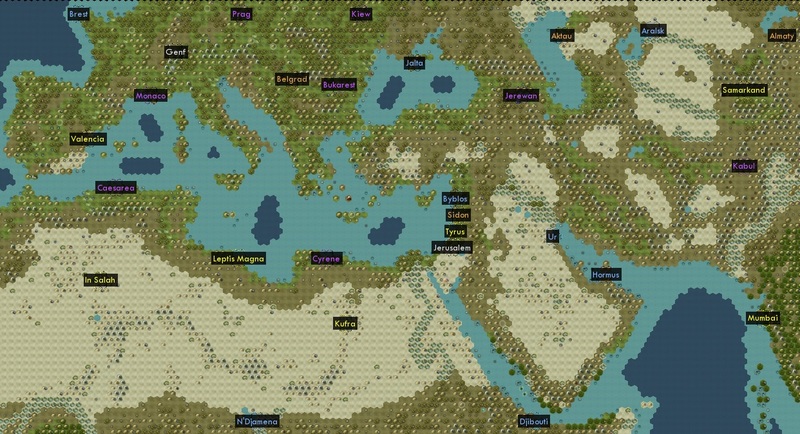 The original starting locations are still found on the map as "random player start position", in case you want to make any changes, or you want to add your favorite civilization again. Any comments or improvements are appreciated. I have attached a file with only start locations, so that you can choose the spot for your initial cities. This also enables the AI to start with their usual bonus units on higher difficulties. Something I noticed in my recent test. Really nice map. Trying now. The problem with the changes you made recently (no preplaced cities) is, that the city-states keep their original names. So for example Tirana is now "old" Genua and so on. Could you preplace the citystates again? Added Syktywkar as Cultured CS north of Russia to fill the gap. Replaced Brusseles with Antwerp (Mercantile), Brusselles is now somewhere in Eastern Europe under another name. I have just rewritten the first post and included any changes. There is a BNW version of the map available now and both map files, G&K and BNW version, are attached to the first post. Hopefully there are no flaws this time. Last time I forgot to switch off Information age for Persia, this is already fixed now. So everyone starts in the ancient era. Sorry for that. If someone could tell me how to add more than 22 civs in the world builder, than I will make a version with all civs included. Corrected color code for Copenhagen, because it is Maritime. Thank you to everyone who downloaded and tested the prior versions, do you have any improvements, or remarks? I like your map, it seems really well done! One question that bugged me from downloading it: aren't there too many CSs? If you consider the map size (92x80) it is unlikely that you will meet them all before satellites. And there should be city states available to all civilizations in terms of trade routes, bonuses, etc. That is why I decided to spread them to every region of the map. When you play the map, it feels like you would play on a Standard map. You encounter enough city states in your neighborhood. I just did not like maps where so much CS's where concentrated in the center, like on other Europe maps. By spreading them, every area is now balanced and playable, no matter if you play the Mongols or Moroccans. And as you know, some will be conquered and some will be bought, so probably not all of them will even survive. I have not tried a Diplo victory yet. But I will try to play it with Greece in the BNW version now. It will probably be a challenge to meet all civs first, but Greece has a good starting point for it. If more people want it, then I could make a version with less CS's. Map looks great! Any way it can be coded to have all the TSL of the civs, and just choose any 22 of them? Hm, maybe somebody here knows the trick and could pull it off for Civ5 too? Thanks for making this, it looks great. Just one thing stopping me from getting into it. Epic game pace. Is there a way to change that? It doesnt work if I change it to normal in setup. It says "World builder has stopped working" right at the start. I have tried to fix this for one and a half hour now. Thats a shame its not working. Did you see this thread? Im not sure if thats helpful or not. I think I would like less city states too. Im not sure why though, its a just a feeling. Maybe even a "slim" version with alot less civs and states to go with standard pacing. Put in the big names and let them expand into big dynasties sort of thing. Anyway good luck. I certainly like playing on real world maps alot more than random so fingers crossed. Edit: just read that thread and it seems like its not working there. Maybe you have that version already. Or maybe its just one guy having issues. But I have already tried to subscribe to it yesterday. Sadly its not working for me, it does not update to the new beta build. Anyway, I am now on holiday. Maybe I can find a solution somewhere. Quick question: If you play this multiplayer, will the CS's not be where you placed them? I thought if you wanted a CS to be where you placed it in worldbuilder, you had no choice but to play the map as a scenario, and you can't do a scenario in MP. Am I wrong about that? I'd love to know if you can play this in multiplayer with all the CS's you've put on here, in the locations you've placed them. Thanks! I immediately added a new version (version 7) for Brave New World. There are 4 different new maps attached to the first post, with standard or epic speed and less or full civilizations and city states. The new map files for version 7 are attached to the first post. Feel free to download and leave a comment, whether you like it, or if you find any bugs. I usually do not play multiplayer, but I think Firaxis was working on a fix for this, because they asked us to check if we could load scenarios in MP. Maybe the newly saved maps will do the job. I don't know. Maybe you can test it with version 7 and confirm whether it works not? Im using TSL BNW map with 22 civs right now, as Great Britain. amazing map. The most fun Ive had since Civ 5 came out. Love the idea of just 15 civs, for faster turns, but is there any way for England to be included with 15 civ setup? England and Celt wars are some of the funnest. Love the idea and will try it out, but one suggestion: Move Krakatoa to in between Sicily and Italy to represent the volcano island Stromboli, since Santorini already is well represented by the Great Barrier Reef twins. I wish there was a land volcano to represent Etna and Vesuvius, but that will have to be modded. Thank you for the comments. I am glad you like it. The problem is, as soon as one Civ gets removed, there is somebody out there, who really liked to play with it. In the 15 Civ version I made some really hard decisions, one of them where England, Spain and the Netherlands, who lost in favor of Assyria, Portugal, Poland, etc. So basically for the new BNW civs. Also Venice, Sweden, Ottomans, Byzantium, are all out in the smaller version... I think the best solution then is to play with the 22 Civ version, because I will never be able to satisfy everybody, unless I find a way for you to select your desired Civs in the settings.